This project was up and running from 2005 to 2009. At some point, we would have had to update to another, newer open source basis for administrating the sounds and this turned out to be a lot more intractable than anticipated. On the other hand, the interest of the community in open:sounds depended largely on record releases and the repository was only used after calls for contributions to physical release. So, consequently, we decided to stop this experiment and see if there would be a better, more feasible way to share sounds within the female:pressure community in the future. In May 2005 open:sounds was created as an online production platform for the female:pressure community to exchange sounds and remix each others' tracks. [female:pressure is an international database for female artists in the fields of electronic music initiated in 1998] Under the terms of a liberal creative commons license attribution-noncommercial-share alike, members of the community may freely use the musical material for new productions and remixes. For us, this is an alternative to the conventional and sluggish way of producing our music under the full restrictions of copyright. open:sounds thus is a resource of sounds, patterns, melodies, vocals and songs created by, and accessible to, artists who are listed in the female:pressure database. With this project we hope to stimulate and show-case the creative potential of the approximately 980 artists from 51 countries [january 2008], that make up the female:pressure community. Our goal is to cultivate the exchange of ideas and sounds and raise the visibility of female creations in the seemingly male dominated fields of electronic music. To the public the finished tracks will be made available under the more restrictive creative commons' music sharing license attribution-noncommercial-no derivative works 3.0 unported. This license permits redistribution, but prohibits commercial and derivatives uses. you could listen to streams of all open:sounds tracks. 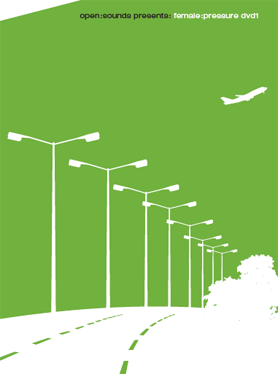 to the public, streaming is available under creative commons attribution-noncommercial-no derivative works 3.0 unported license. 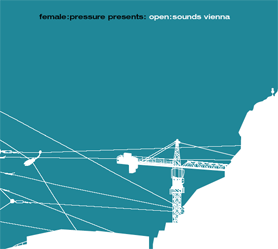 Our next step is to release a free dvd that showcases Vienna based VJs and video artists but this time accentuates the international character of female:pressure by using open:sounds music of various origin: female:pressure dvd1. Official release date is march 8, 2008. Physical distribution will be carried out by Hardwax, Berlin. 14. video: Ni & boesebertha; audio: Chez Debs - Mind Out! please find video preview, DVD press release in english and german, detailed video artist info, detailed audio artist info and project credits on http://www.femalepressure.net/dvd.html. The first results of open:sounds were available on a free CD. All tracks by Vienna based artists. Released in March 2006.